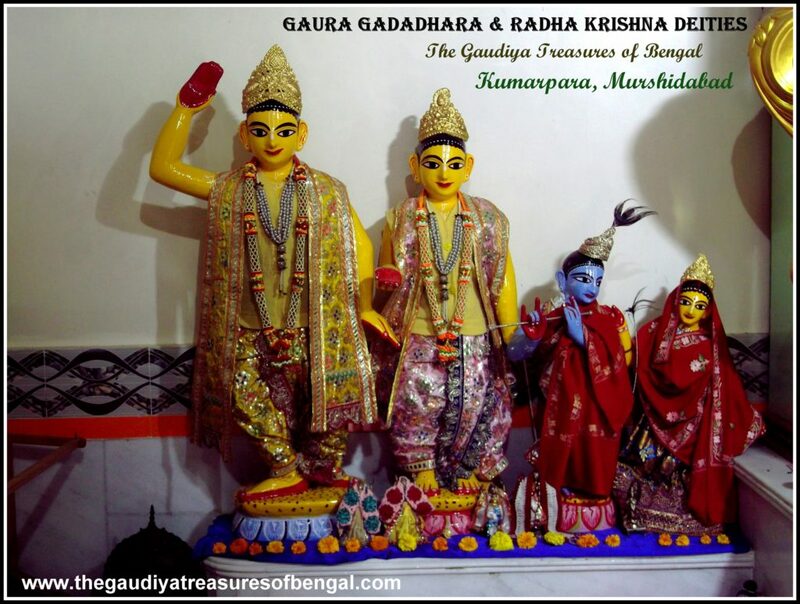 Sri Jiva Goswami had instructed Sri Vamsivadana Ghosh, who was his grand-disciple (disciple of disciple), to carry these Radha Madhava deities and install them in Gauda Mandala (Bengal). Accordingly, Sri Vamsivadana began his journey. There were no proper roads in those days and as a result, Vamsivadana had to follow the route along the Ganges. He traveled on foot and reached Bengal after a year. The journey was very difficult, as we can imagine. Vamsivadana had to beg for his food and offering bhoga unto his deities. After a year, he arrived at Kumarpur in Murshidabad and was en-route to Navadvipa. 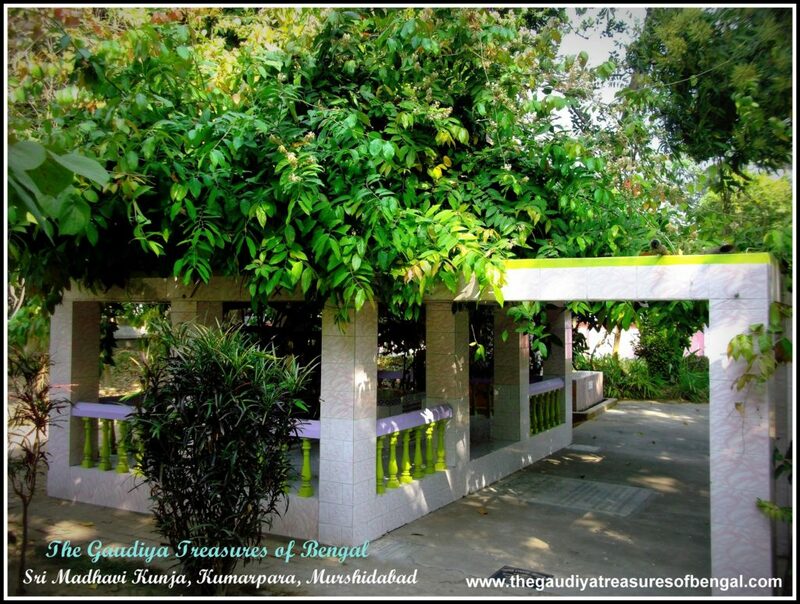 He kept his deities under the shades of this Madhavi tree and decided to take some rest. Sri Radha Madhava then appeared in his dream and instructed him to install them at that very place, under the Madhavi tree. They also asked him to begin their worship at that place. 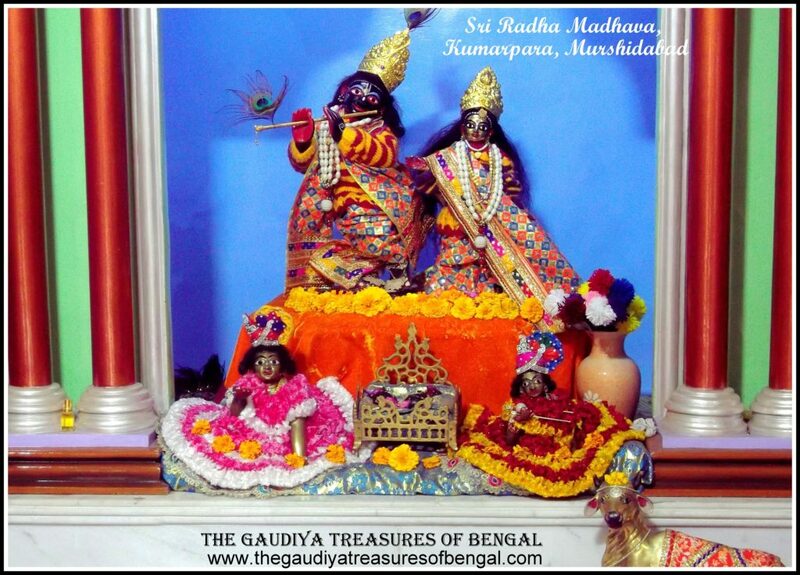 Accordingly, Sri Vamsivadana established the worship of Sri Radha Madhava at Kumarpara, and these deities continue to accept our humble services at this place, till this day. It is said that if you do not find peace anywhere in this world, you shall definitely obtain it here, under the shades of Madhavi Kunja. During the reign of Nawab Alivardi Khan (18th century), his nephew Nawazish Muhammad Khan decided to test the prowess of Sri Radha Madhava. He felt disturbed hearing the sounds of conches and cymbals coming from Madhavi Kunja. So one day, in order to pollute the temple and defame it, he sent an offering of meat unto Radha Madhava. He covered the offering plate so that it is not visible from outside. But to the surprise of Nawazish, this offensive offering was immediately converted into jasmine flowers. He tried once more, sending another plate of meat. But again, he was disappointed to find the meat transforming itself into jasmine. For those who do not know, Lord Krishna, who is also known as Madhava, is strictly worshipped in the mode of goodness or transcendence. The only permissible items that can be offered unto Radha Krishna deities are pure vegetarian foodstuffs devoid of even onion and garlic. It is an offense to offer meat, fish, eggs, etc unto Krishna or any of His incarnations. Similarly, the Vaishnavas, who are the devotees of Krishna, lead a very strict life, sustaining themselves only upon the food that has already been offered unto their beloved Lord. Thus even Vaishnavas live on pure vegetarian diets (no onion, no garlic) and it helps them obtain the Lord’s mercy and thereby advance in their devotional life. After this pastime, Nawazish khan developed a deep faith and respect for Sri Radha Madhava. He banned the killing of any animals, fishing, hunting or any such activity in the vicinity of the temple. He even assisted in building a part of the temple and encouraged fellow Muslims to visit Madhavi Kunja and seek the shelter of Radha Madhava. We worship the lotus feet of our spiritual master ,whose causeless mercy has empowered us ineligible fools ,to gain entrance and take up service in this sacred land of Kumarpara. We seek shelter of this holy abode, and pray that its glories remain forever imprinted in our heart.‘The Gaudiya Treasures of Bengal’ offers millions of obeisances and humbly prays to Radha Madhava jiu that we advance in our Krishna consciousness,develop attachment unto their lotus feet and are able to serve Sri Guru & Vaishnavas, by our honest and sincere efforts. We seek blessings and compassion of the lordships, in successfully rendering this humble service of reciting the pastimes and revealing the pastime places of the Lord and His beloved associates.We shall consider ourselves greatly fortunate and our existence meaningful if Lord Gaurahari and our dear spiritual master are kindly pleased with our endeavours. People from different communities and religious background participate wholeheartedly in the festivals conducted by the temple authorities. Festivals like Dol Purnima, Janmashtami, Radhastami, Jagannatha Snana yatra are celebrated with great pomp and show. 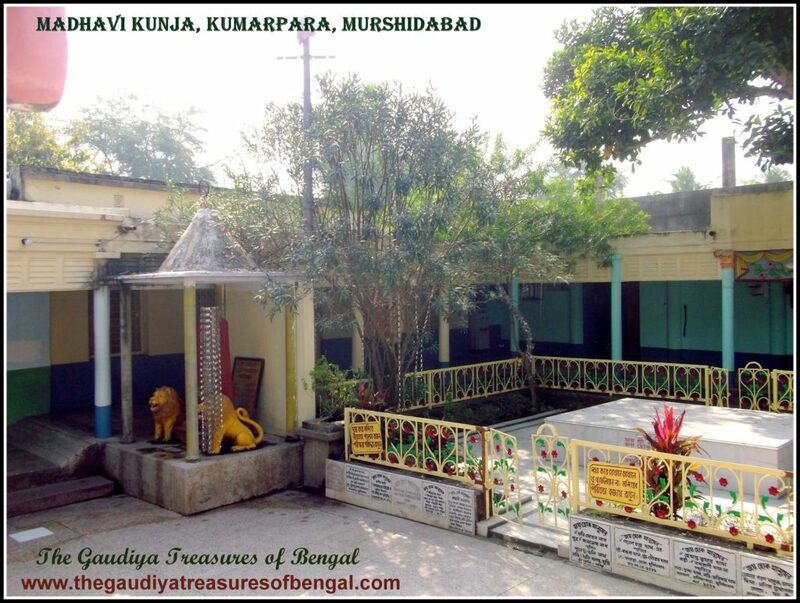 This temple, situated at Kumarpara, is hardly a ten minutes ride from the Murshidabad station. 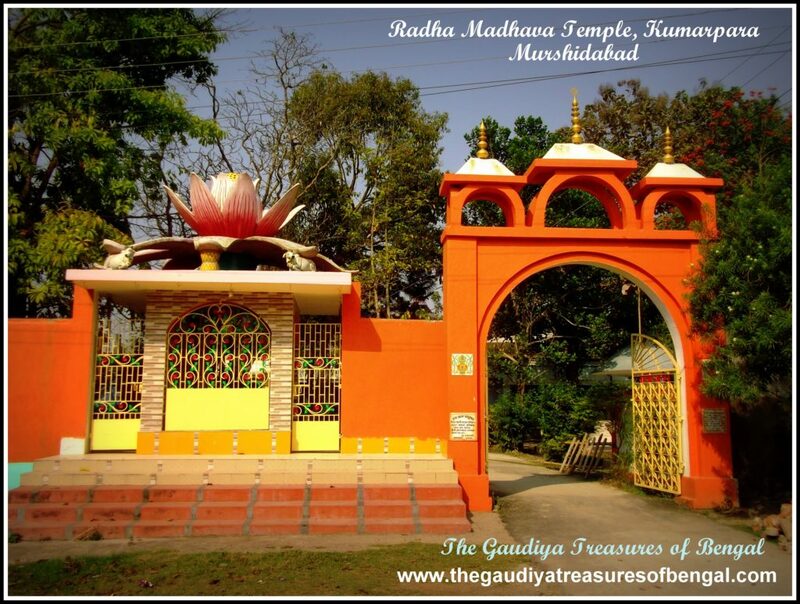 Madhavi Kunja is locally renowned as the temple of Sri Radha Madhava. Some people also refer to it as Sripat Kumarpara. Murshidabad is well connected to Kolkata via roads and railways and it takes hardly a few hours for one to reach Murshidabad from Kolkata. Accommodation – One can choose to stay at any of the prominent hotels of Murshidabad city.